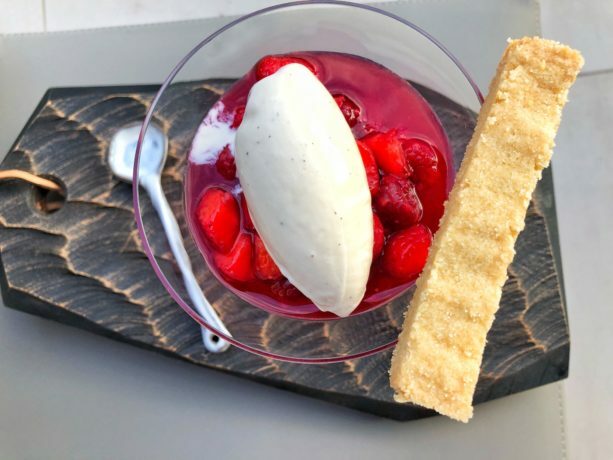 If you can’t make it to The Southbank Centre in London next week to try my menu, here at least is the dessert. I can’t remember where I got the inspiration, it was just one of those light bulb moments. Have you ever seen an affogato that isn’t coffee? The word simply means drowned. It has nothing to do with coffee. 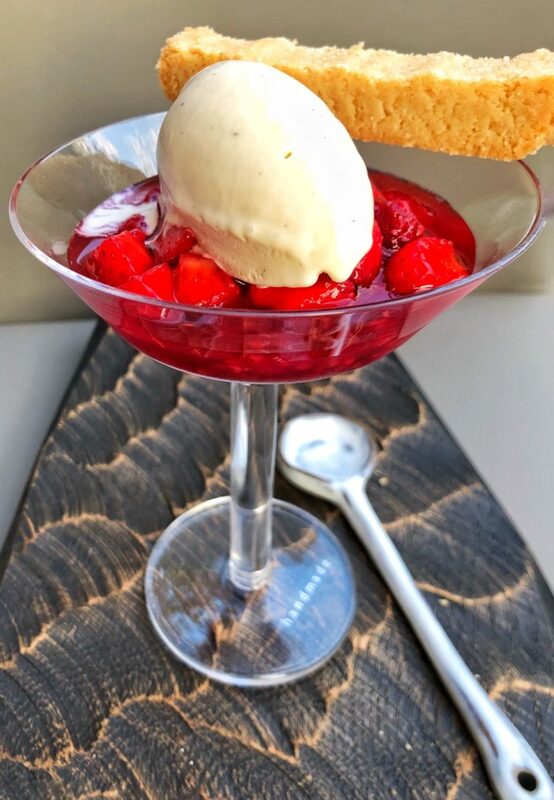 It is just some delicious macerated berry juice and chamord poured over strawberries with a very creamy tonka bean ice cream. The shortbread is the result of many trials and tribulations. Utlimately, the better the butter , the better the shortbread. August is a relatively quiet month for me. Apart from my residency at The Southbank, 14th-18th August, I’m pretty much flying the rest of the time. i have quite a few things pencilled in for September. I’ll update the “Events” page when i have confirmation. Warm milk, cream, sugar and gellan gum. Grate the tonka beans in. Whisk the egg yolks until pale and fluffy. Add a third of the milk and then return to the pan. Cook until 83°C. Pour out into a pyrex to help cool quickly. It will solidify, blitz and then churn as normal. Make a stock syrup by heating the water and sugar. Then pour this over the frozen raspberries. Keep turning the beriies over for an hour. They will release their own juice. Cut the strawberries into cubes about 5mm square and add to the mix to macerate too. For the shortbread, place all ingredients into a bowl and rub in with your hands. It will slowly come together. Press into a ball and then into a 2lb loaf tin. This should fill it to about 2cm height. Place in fridge for 30minutes. Then cook at Fan 130°C for one hour. Cut into 2cm slices, widthways. Remove and separate the biscuits. Give them another 15minutes for the inner ones to be fully cooked. Let cool. Looks incredible. Will be trying this. Thanks Mary, pleased you approve. Thanks Pat, I hope I enjoy it and it’s not too stressful. The dessert looks wonderful, thank you for posting the recipe because I know I won’t be able to make it. I’m so happy that you are having such fun with your pop up dinners, the food looks and sounds amazing. I still have some of the tonka beans that you kindly brought for me, I will save them for this special dessert. It is perfect for summer. Why don’t you cut the shortbread before you bake? Good question, Eva. Basically if you cut them, they melt as you cook them and don’t hold their shape. I will try your recipe, I still haven’t found the perfect, melty shortbread yet.